2008 Readers' Choice Awards by Technical Analysis, Inc. ARTICLE SYNOPSIS...We are pleased to present the Technical Analysis of Stocks & Commodities magazine 2014 Readers' Choice Awards (RCA). ARTICLE SYNOPSIS...We are pleased to present the Technical Analysis of Stocks & Commodities magazine 2015 Readers' Choice Awards (RCA). 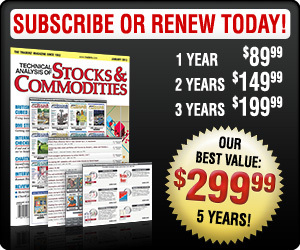 ARTICLE SYNOPSIS...We are pleased to present the Technical Analysis of Stocks & Commodities magazine 2013 Readers' Choice Awards (RCA). Readers' Choice Awards 2005 by Technical Analysis, Inc. Readers' Choice Awards 2006 by Technical Analysis, Inc. Readers' Choice Awards 2007 by Technical Analysis, Inc. Readers' Choice Awards by Technical Analysis, Inc.